Your school is a big place, with rooms for lots of different activities. You walk in through the entrance, and pass the main office while you walk down the hall. You have classes in classrooms and lunch in the cafeteria. You play games in the gym, or maybe outside on a field or a court. We won't cover all the places you'll find in a school in this lesson, but we'll cover some of the basics. 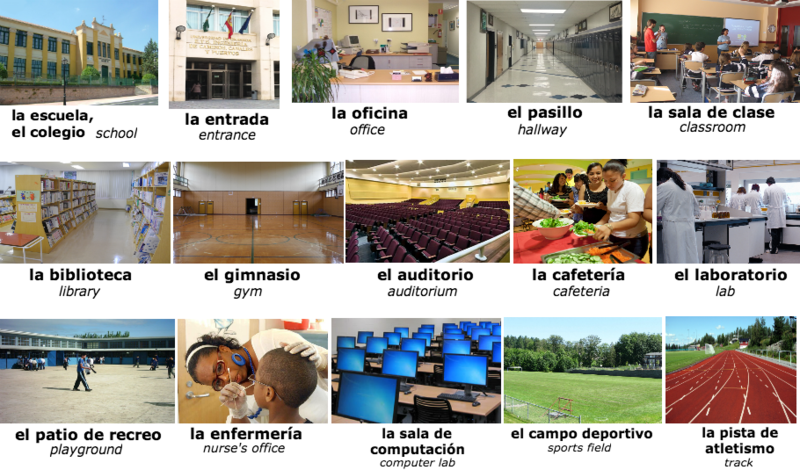 Some of the ones that aren't on this list are ones that are also found in your home - el baño (the bathroom) - or at the park - la cancha (the basketball or tennis court), el campo (the soccer or football field), y el diamante (the baseball diamond). 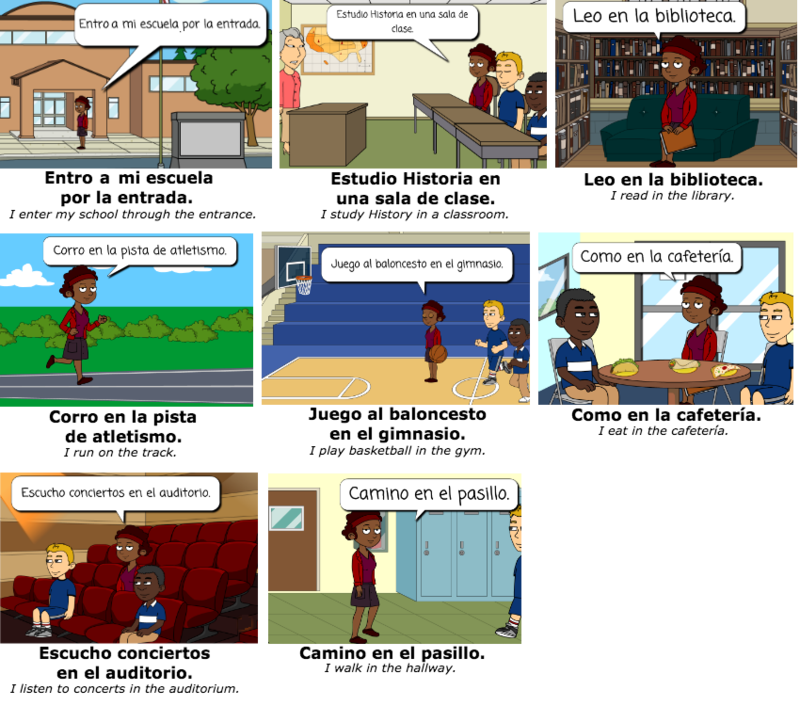 Some of the other words we won't cover are the word for building - el edificio - and items you can find in pasillos - like los armarios (lockers). Hay muchos lugares en una escuela. There are many places in a school. Hay una oficina en cada edificio. There's an office in each building. Hay pasillos en cada edificio. There are hallways in each building. Hay salas de clase y baños en cada edificio. There are classrooms and bathrooms in each building. Hay un gimnasio en el edificio principal. There's a gym in the main building. Hay un auditorio en el edificio de ciencias. There's an auditorium in the science building. Juega una adivinanza a ver si recuerdas los lugares en una escuela. 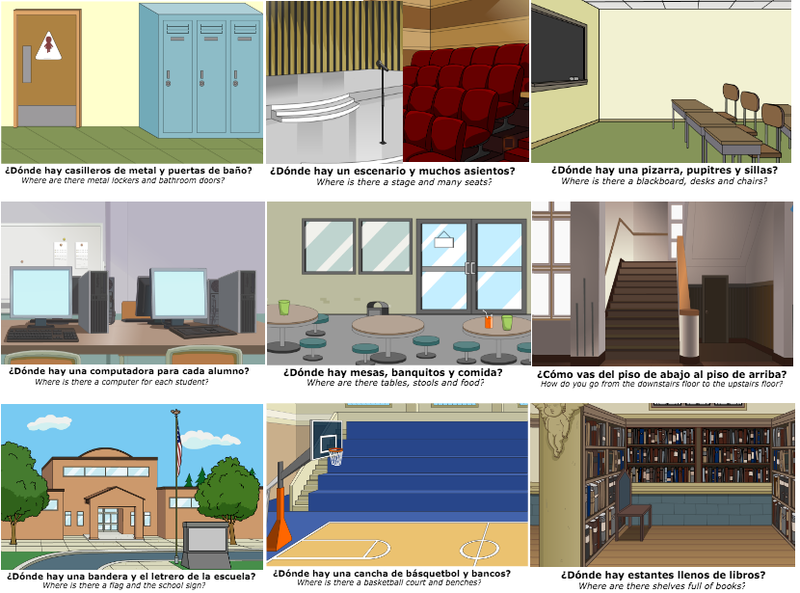 Play a guessing game to see if you remember the places in a school.